Thumb Keyboard, our favorite tablet app of all time, received a spicy little update today that allows users the ability to slap on a custom background. The creative possibilities are almost endless now for an app that already makes life with a big screened device super efficient and fun. Besides the custom skins though, compatibility with smaller screens was improved along with some volume settings. And remember, these are all add-ons to the major 4.0 update that went live a few weeks back that introduced over 25 high quality themes and a whole bunch of customizable features. I know that I have said this a number of times already, but if you own a tablet, you should also own this app. 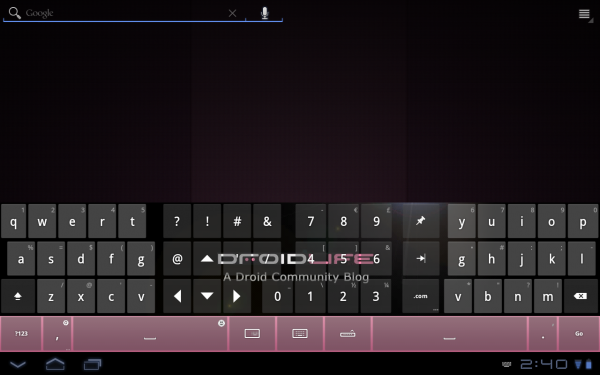 Option to set the keyboard background (create your own background or download special for the keyboard optimized backgrounds). Adjustable volume, with better keypress sound handling. Fully compatible now with smaller screens (hvga and qvga). All features supported. Maintenance (bug fixes and better memory management). Cheers to @wjddesigns for the hookup!